Although Mr. Bernanke is now retired from Chair of the Fed, Janet Yellen, his successor, has vowed to follow through on his monetary policies. In fact, she was chosen to head the bank specifically for this reason. Quantitative Easing (QE) has been politicized in a manner which has distorted what it actually is. Phrases like “the Fed is just printing money” are used by critics to alarm an unwitting viewer. The Fed has a dual mandate of controlling inflation and managing unemployment. It has a handful of tools which it selectively uses to achieve these goals, one of which is quantitative easing. When Americans go on spring break to Cancun, the second they land, they start buying everything in sight because everything seems so cheap. T-shirts with a Corona print are $2. Instead of buying one, we buy five, because $10 is nothing for five Corona T-shirts. A silver ring from a kiosk on the beach is $7, so why not buy one or even two. Water is $0.25 per gallon so let’s buy four. A rum and coke is $3, there is no limit to how many I may buy. The reason American’s buy excessively when in Mexico is because what makes everything so affordable is that the dollar is worth 13 times more than the Mexican peso. When one currency is stronger than another, it means that you can afford to buy more merchandise in that country. And that’s it. That’s all that Quantitative Easing is. In a slightly more technical form, when the Fed increases the money supply through printing more dollars, it devalues our currency relative to foreign currencies because there is more money flowing through the system. The process of getting the money into the system is via buying government bonds (e.g. municipal debt). When the value of the dollar decreases, it makes other countries who buy our exports feel richer, because, just like an American in Cancun, when the buyer’s currency is worth more than the seller’s currency, you can afford to buy more of that country’s products. With a stronger currency, foreign countries buy more of our goods. That results in an increase in our exports which means factories have to hire more workers to meet the new demand. This decreases unemployment and increases our total GDP output. Also, contrary to the grave concern vocalized by hawkish congressmen such as Ron Paul, inflation remains well below the targeted level. In fact so much so, the Fed is now more concerned with deflation than inflation (something Mr. Paul should take note of the next time he thinks he understands economics well enough to opine). 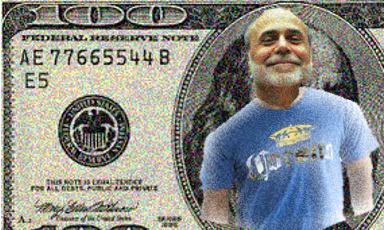 Mr. Bernanke knew that inflation would not be a problem because with no demand, you can print all the money in the world and inflation will not tick up.